Movie lovers rejoice. With 15 movie channels and all of the programming in America's Top 200™ plus 60 additional channels, you'll get over 260 channels of the best entertainment making this package your top pick for flicks. 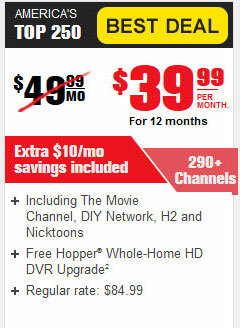 Plus, get the local channels available in your area included at no extra charge.